THIS POST IS IN HONOR OF NATIONAL TRAILS DAY, WHICH IS TODAY–JUNE 6TH. Long-distance hikers commonly refer to America’s triple crown hiking trails. The pictures, top to bottom, follow the order below. Appalachian Trail (AT) This is the grand daddy. It runs through 14 states from Georgia to Maine and is 2178 miles long. Many aspiring thru-hikers start with this trail. Most begin in Georgia, in Spring, hoping to follow seasonal weather as they plod north. You should allow six months to hike the AT. By general consent, the toughest parts are the White Mountains of New Hampshire and the Mahoosucs in Maine. It is still the most popular long-distance hiking trail in America–maybe the world. Pacific Crest Trail (PCT) Incredibly scenic and gaining in popularity, the PCT runs from the Mexican border into British Columbia, Canada. It is 2650 miles long, longer than the AT, but most thru-hikers finish it in less than six months. This may be due to the long, wide, scenic traverses along the “crests” of mountain chains, which make for easier hiking. Where much of the AT is dense, the PCT is more open. The PCT includes part of the Mojave Desert, Yosemite, and the Cascade Mountains. Continental Divide Trail (CDT) Still a work in progress, this rigorous but rewarding trail also extends from the Mexican border to Canada. It is about 3100 miles long and has a spectacular run through the Rocky Mountains. Navigation skills–map and compass–are needed to thru-hike this trail. Many sections are not well marked and one needs to constantly focus on bearing to avoid getting lost–lest you end up like the bones above, which I hiked by in southern New Mexico. 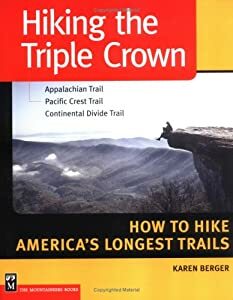 For a thorough description of these three trails, I suggest the book Hiking the Triple Crown, by Karen Berger. This entry was tagged Appalachian Mountain Club, Appalachian Trail, backpacking, camping, Continental Divide Trail, hiking, long-distance hiking, Pacific Crest Trail, thru-hiking, Triple Crown of Hiking, White Mountains. Bookmark the permalink. Thanks, Judy. Kind of wish I was out there on a trail right now. Can’t wAit to do them all some day! Already tagged the AT, PCT is next spring and then the CDT is somewhere off in the future. One at a time! I will have to check out that book.